President Jammeh's term ends on Thursday. The African Union has said it will no longer recognise Mr Jammeh's rule beyond this point. 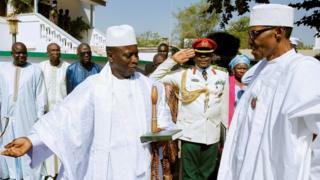 Nigerian leader Muhammadu Buhari had flown to The Gambia's capital, Banjul, to try to broker a deal, as the region fears the consequences of a non-peaceful transition. A lawyer for Mr Jammeh filed a request with the Supreme Court on Thursday, asking for an injunction to block Mr Barrow's swearing-in. Mr Barrow won 43.3% of the vote in December's election, compared with Mr Jammeh's 39.6%. A third candidate, Mama Kandeh, got 17.1%.